Here we see 2001 Malaysian cup winners Terengganu celebrating with the trophy after beating their nearest rivals Perak 2-1. Almost a pastoral scene as we catch the Swifts in early season action, going down 1-0 at Hitchin Town in front of what looks like a very exclusive crowd. 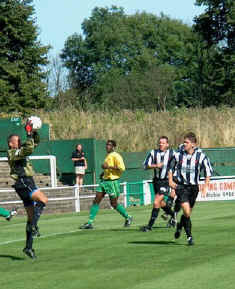 The Swifts, currently 15th in the Ryman Premier League, first adopted the black and white colours in 1893 after having dabbled with both blue and white and green and white kits. Some more meddling in the 1950's saw the stripes briefly changed to quarters, but thankfully tradition prevailed after a couple of seasons. Heybridge is to the East of Chelmsford, near Maldon in deepest Essex. Things aren't going well at the moment for the Colliers, as they stand 14th in the Northern League First Division. At present they're ahead of the clubs clustered round the bottom of the table, but having played more games than all those below them they urgently need to rediscover some form. This last week or so has been especially miserable, a 9-2 stuffing at West Auckland being followed by a 4-0 reverse at Chester-le-Street. 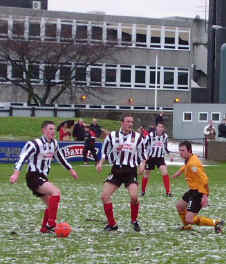 Even the League Cup provided no shelter from the goal avalanche, with a visit to Tow Law ending in a 3-0 loss. Away back over the border again, and here we see recent Scottish League entrants Elgin City proudly displaying their stripes in a recent 2-0 win at a frosty East Fife. 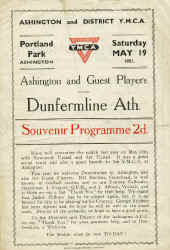 In this, their second season since graduating from the Highland League (along with Peterhead) City have settled in a mid-table position but went down 3-1 at Stirling last weekend having shared eight goals at the miserable hole that is the Cliftonhill ground of Albion Rovers in the previous game. A small slice of Mid Solent Boys Football League history for you today. 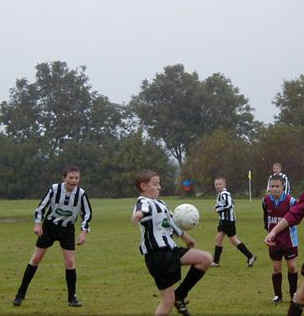 The team in the stripes is the U13 side of Fareham Sacred Hearts Junior FC, who in the year 2000 were doing battle with fierce local rivals such as Funtley and Locks Heath Lions. Unfortunately we understand the side has now opted for a mostly white shirt with black sleeves, which just ain't black and white stripes. We mourn their passing from TAPIBAW with a piece of match action from November 2000, in what looks at first glance like the 1974 semi between ourselves and Burnley but was actually the claret of Locks Heath triumphing 4-1 over Fareham.